Crypto currency is one of the most innovative new financial technologies available. Gibraltar is at the forefront of this promissing digital financial engineering and has been receiving high acclaim within global distributed ledger technology and cryptocurrency circles. On the 1st of January 2018 Gibraltar became one of the first jurisdictions in the world to regulate businesses and individuals who are using distributed ledger technologies to hold or transfer value for others. 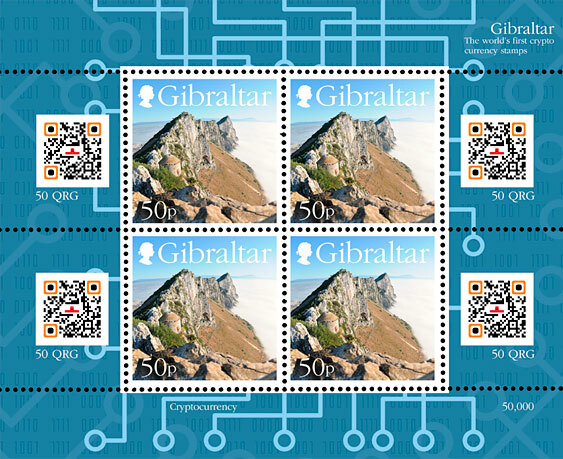 Gibraltar wishes to commemorate this innovative new technology by issuing a persoanlised stamp sheet featuring the Rock of Gibraltar issued stamp to highlight and demonstrate this new technology. The 50p stamp and its four-stamp collector block below has been created by local graphics designer Mr. Stephen Perera.